Lest I give the impression that it is all doom and gloom having a kid with a disability – here is our reality to provide some needed balance. YES systems are BAD. YES some people who say they will help you DO NOT HELP YOU and this is especially BAD. But also YES some systems are good, like most things to do with recreation, which are easy to access, and FUN. Aaron plays Challenger Baseball, which is the most awesomely organized recreation activity for kids with disabilities EVER. You show up with your kid, whatever age, whatever difference they have, and they get assigned a peer buddy to hang out with and they have FUN. I do not have to get my pediatrician to fill out a form proving Aaron has Down syndrome or have a psychologist administer an IQ test for Aaron to play baseball. (Sarcasm intended). (Special Olympics is pretty good, although they demand a cervical spine x-ray for kids with Ds – an x-ray that isn’t even relevant anymore). I don’t see Challenger Baseball or Special Olympics as anything ‘special’ – I firmly believe that my kid should play sports as easily as any typically-developing kid can. Challenger, in particular, makes it easy for this to happen – for my kid to be active, be part of a team, learn some skills and have fun. There is another group in Vancouver called Soccer Dogs that has a similar philosophy. This past month has been crammed with some extraordinary activities for Aaron because he has a disability. I’m totally ok with that, considering all the cursing and struggle he has in the health and school systems – any perks? Bring ’em on. The school arranged a day at the Playland at the PNE, which was sponsored by the CKNW Children’s Orphans’ Fund. That was super because it was adapted – shorter line-ups, lots of volunteers to go rides with kids. In Edmonton, Northlands has a similar event in July called Magic Monday. There was some pizza and bowling action for the kids with special needs at school on Friday…and a Challenger Jamboree (more pizza) and we attended the Lower Mainland Down Syndrome Society picnic at beautiful Belcarra – there was a nature interpreter who took us families on a tour of the sea life, which was very informative for us prairie folks. This is a photo of a super activity from Vancouver Fire and Rescue Services. Aaron and I received an invite from a lovely recreation therapist that I work with at Sunny Hill Health Centre for Children. 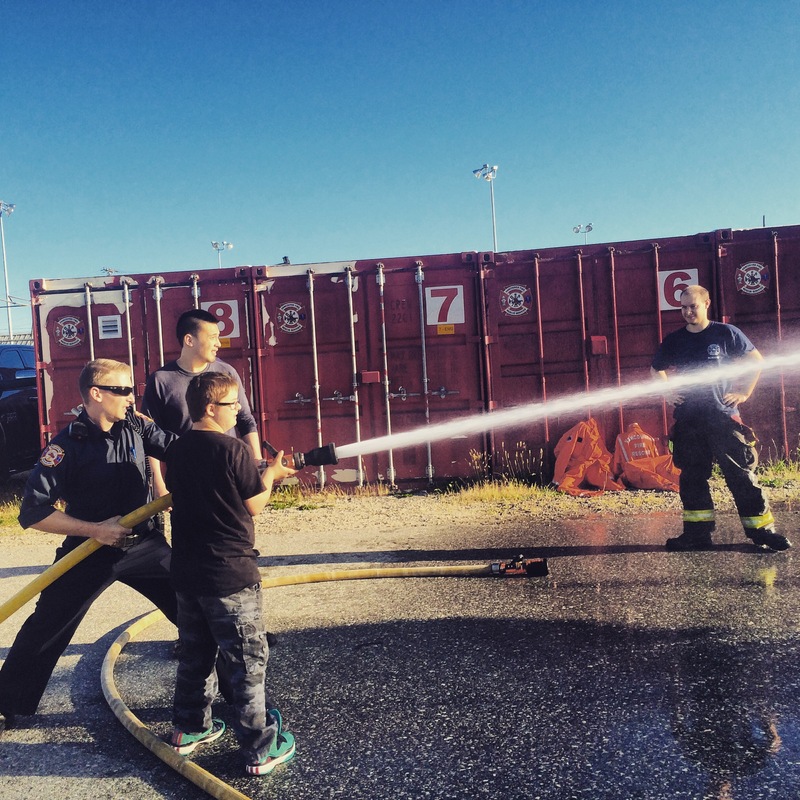 We felt very fortunate to be included in this fabulous event – which included even more pizza, real rides in real fire trucks round and round the block with the sirens wailing, and holding the fire hose and aiming at pylons, a building and (most fun) one of the Fire Academy students. My absolute favourite part of the night was seeing the fire fighters lifting kids up from their wheelchairs into the fire trucks for a ride. Now that was pretty special. I even got to go for a ride in the fire truck and I COULD NOT STOP SMILING. I’m not even counting all the kindnesses, lollipops, cookies and extra stuff that I know this kid gets because he’s Aaron. It is very important for me to pause and be thankful for the people who go the extra mile for our kids. Lucky? Yes. Fortunate? Yes. Blessed? Yes, that too. The fact is that Aaron has a very good life – he is beloved and he is loved. And isn’t that what we all want from this earth?